Leichhardt is named after the Prussian explorer Ludwig Leichhardt, in the 1840s. Since the middle of the 20th century, Leichhardt has been a centre for Sydney’s Italian community. Leichhardt is known for its fine restaurants and cafes, parks and historical buildings such as the Town Hall, Post Office and Public School buildings. The suburb is well located providing easy access to the city and the harbour. Leichhardt Congregational Church was formed 1st January 1885. 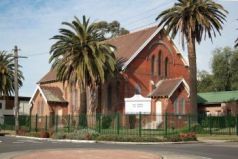 Ministry started initially through the support of Petersham Congregational Church in 1881 with a mission group working in the area and the formation of a Sunday School. In 1985 Leichhardt became independent of Petersham using a mission building until the main church building, which stands on the corner of Allen and Elswick streets, was erected in 1911. Leichhardt Congregational Church was instrumental in the establishment of Sydney Missionary and Bible College. After serving for thirteen years as missionary with CIM in China Benson Barnett moved back to pastoral ministry in Tasmania. In 1916 with no money to speak of he moved his family to Sydney to look for a suitable place to establish a college tor the training of missionaries and church workers. At the same time he answered the call to become pastor of Leichhardt Congregational Church where he faithfully served until 1937. The Sydney Missionary and Bible College was commenced at Croydon in April 1916 with an initial enrolment of 8 students. This college is now the oldest missionary training centre with a continuous history in Australia. In 1916, Barnett stated the aim of the College: ‘The SMBC is an attempt here in Australia, to meet a very definite and deep need by providing the opportunity for any young man of consecrated life and character, to fit himself by definite study, and training in the knowledge of the things of God, for any service he may wish to undertake. Not only is it an attempt to hold open a door for such young men as may feel the hand of God upon them, but it is an attempt to provide a place where they may find a congenial spiritual atmosphere, where they may gain such experiential knowledge of God, that they shall truly “know Him”, and go out and be strong and do exploits as a result of that knowledge’. Barnett remained principal until he resigned in 1937 owing to ill health. He is remembered as a man of scholarly ability, gentle humility and unswerving faith in God.